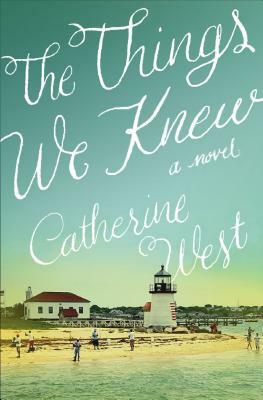 Highly acclaimed author, Catherine West, weaves a story of family and lies, secrets and repressed memories all against the stunning backdrop of Nantucket. When their tragic past begins to resurface, can he help her remember the things she can't? After her mother's death twelve years ago, Lynette Carlisle watched her close-knit family unravel. One by one, her four older siblings left their Nantucket home and never returned. All seem to blame their father for their mother's death, but nobody will talk about that tragic day. And Lynette's memory only speaks through nightmares. Then Nicholas Cooper returns to Nantucket, bringing the past with him. Once Lynette's adolescent crush, Nick knows more about her mother's death than he lets on. The truth could tear apart his own family--and destroy his fragile friendship with Lynette, the woman he no longer thinks of as a kid sister. As their father's failing health and financial concerns bring the Carlisle siblings home, secrets surface that will either restore their shattered relationships or separate the siblings forever. But pulling up anchor on the past propels them into the perfect storm, powerful enough to make them question their faith, their willingness to forgive, and the very truth of all the things they thought they knew. Catherine West writes stories of hope and healing from her island home in Bermuda. When she's not at the computer working on her next story, you can find her taking her Border collie for long walks on the beach or tending to her roses and orchids. She and her husband have two grown children. Visit her online at catherinejwest.com, Facebook: CatherineJWest, and Twitter: @cathwest. In The Things We Knew, Lynette’s attachment to Wyldewood, the house she grew up in, is very strong. Why do you think she feels this way? Have you ever felt so attached to a particular home or place? Change is often unavoidable. In The Things We Knew, Lynette’s life is changing dramatically, and she’s doing her best to keep up. Have there been times in your life when everything seemed to be changing too fast and you just wanted it to stop? How did you handle it? Which character/s in The Things We Knew did you relate to most and why? Grace is a prevalent theme throughout the story. It’s often the most difficult thing to do, show another person grace, especially when you think they don’t deserve it. Have you ever been in a situation where you chose grace over judgment? How did that make you feel? Have you been on the receiving end of somebody extending grace to you? Estrangement and fractured family relationships are common in our communities, but so difficult to navigate. What do you think the Carlisle siblings might have done differently to stay closer during their turbulent childhood years? Why do you think they all chose to go their separate ways?